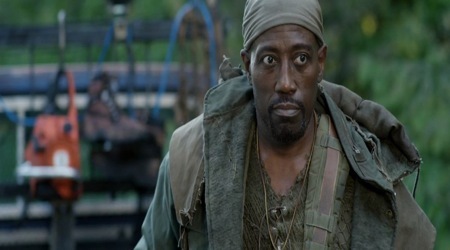 Don't get fooled by Wesley Snipes his presence. This movie really is nothing more than just another formulaic science-fiction/horror flick, featuring a bunch of teenage characters and all of the familiar clichés and other unoriginal moments. Weird thing about this movie is that it's constructed like just another average genre flick, with Wesley Snipes scenes thrown into it. On the one hand his character fits the movie perfectly, but on the other it really doesn't. At times it feels like he's being part of a different movie and the scenes were written into the movie for him specifically. In a way it makes his character a redundant one, though at the same time his presence still does add something to the movie. I wouldn't say that it makes the movie a better one but it does make it remotely more interesting to watch. He's definitely being the best actor in this movie as well, though that really isn't saying much. The movie really lacks an effective enough buildup, with as a result that all of the characters come across as terribly formulaic and unappealing ones. It's hard to care about anyone in this movie, also because you already know in advance who's going to die and who's eventually becoming the 'hero' of the movie. Its predictability makes this movie uninteresting as well as unoriginal, though some other factors are also really to blame for that. It's OK for a movie to be formulaic but when it starts 'borrowing' from other movies we're having a whole other problem. It sort of comes out of the blue, the moment that this movie suddenly turns into yet another "Alien" clone. It also really isn't being very subtle about it. The film-makers probably thought they were paying homage to Ridley Scott's genre classic but there really is nothing impressive, creative, fun or honorable about it. Who knows, if the movie went more down the 'Wesley Snipes road' this movie still could have been a pretty decent, original and fun one to watch. But instead of being fun and featuring a whole lot of action in it, the movie prefers to be formulaic and predictable, by focusing mostly on the horror and mystery elements, while neither the mystery or horror isn't being anything impressive or surprising. It also isn't a very impressive movie to look at. The effects are cheap and in no way add to the credibility of the movie. It just isn't a very well made movie, in just about every way thinkable. Far from the most terrible thing ever, but really, why should you ever watch this movie? I certainly have no good answer to that.